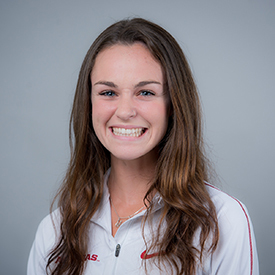 All-Region … Started off her sophomore year as the Razorbacks’ third finisher in the Riverside Invitational (Sept. 17) 5K, placing fourth overall in 17:24.25; an improvement on her performance from the the 2015 season … In the next outing, Brown set a new personal best at the Chile Pepper Festival (Oct. 1) with a 16:50.52 … In the Razorbacks SEC Championship (Oct. 28) win, finished 17th overall and had the seventh-best time for the Razorbacks at 21:07.20 … in her final outing of the season, Brown placed 18th overall and had the sixth-best time at the NCAA South Central Region (Nov. 11) 6K, earning her All-Region honors with a final time of 21:05.00. Came through the line as Arkansas’ third finisher at the Cowboy Preview (Sept. 1) … Finished third in the head to head competition with Tulsa and Oklahoma while claiming the seventh overall spot at the season opener … Placed second overall at the UC Riverside Invitational (Sept. 12) … Finished second for Arkansas posting a time of 17:32.50 … Raced to the top spot at the Missouri Southern Stampede (Sept. 19) … Placed first for Arkansas with a time of 17:08.17 … Competed in the Chile Pepper Festival placing 22nd (Oct. 3) … Set a personal best in the 5K posting a time of 17:06.16 … Finished third overall in the Wisconsin Adidas Invitational B-Race (Oct. 16) and second for the Razorbacks with a time of 21:02.00 … Set a personal record in the 6K at the SEC Championships (Oct. 30) crossing the line in a time of 20:30.30 and placed 20th overall … Competed in the NCAA Championships (Nov.21) posting a 178th place finish … Brown completed her season at Louisville, Kentucky placing sixth amongst Arkansas runners with a time of 21:22.40. A four-year letterwinner at Marcus High School in Flower Mound, Texas … Earned all-state honors as a junior … Individual district champion in cross as a junior … Helped her team qualify for the state championships in cross country twice … Finished fourth in the mile at track regionals … Holds the school record for the DMR and 4×800-meter relay … Holds personal-best of 10:41 in the 3,200m, 4:57 in the 1,600m and 17:52 in the 5k.